Yuhuu! One of my favourite skincare products is cleansing oil. Usually I use cleansing to cleanse my makeup, mascara and waterproof makeup then follow by cleansing foam. Double cleansing is inevitable to make sure all the impurities are cleanse before applying the rest of the skincare products. 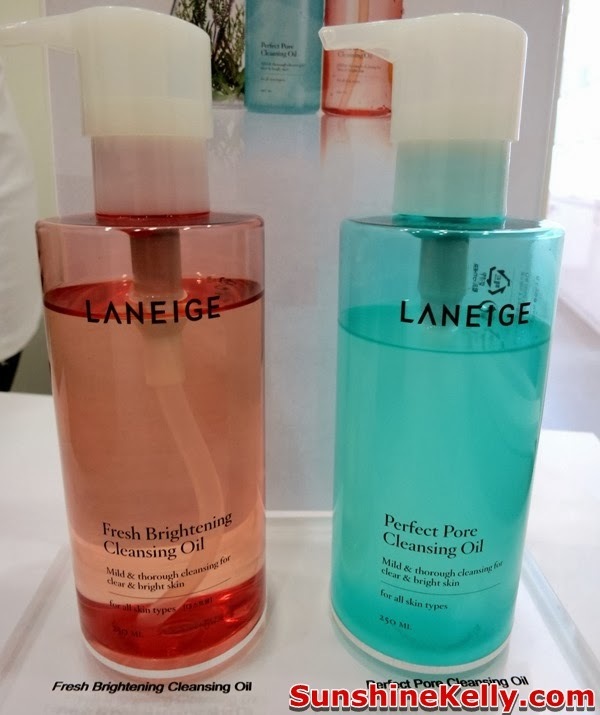 This month I discovered Laneige Fresh Brightening Cleansing Oil and Laneige Perfect Pore Cleansing Oil to address different skincare needs and concerns. Some brief introduction, Laneige Fresh Brightening Cleansing Oil is mainly for exfoliating and brightening purposes. This is more suitable for me, as I have dull and uneven skintone, not only it helps to cleanse away my makeup and impurities it also help to brightens my skin. The Fresh Brightening Oil is lightweight and non-greasy. Pump the cleansing oil onto dry hand and massage onto dry face for a few seconds; especially area with makeup massage in circular motion, then add a little bit of water and continue to massage and after that rinsing off the cleansing oil is effortless. Skin feels fresh, smooth and soft after cleansing. It is ideal for those without heavy makeup and prefers fast and convenient cleansing without having to double cleanse. Loaded with Vitamin C from Grapefruit and Apricot Seed Oil, this cleansing oil does more than just cleansing. It also promotes blood circulation, rejuvenates the skin while relieving skin from redness caused by harsh weather conditions and pollutants. The Grapefruit Extract has a calming and soothing effect as well as antibacterial properties that help relieve irritated skin and reduce bacteria-causing skin troubles. The Grapefruit Extract also controls sebum production for a clearer and shine-free skin. The Apricot Seed Oil functions as an exfoliating agent to slough off dead skin cells allowing the skin to absorb nutrients from the skincare products that follows and also leaves the skin smooth and moisturised. It is also fortified with Hydrophile and Baby Breath Extract, which makes cleansing fast and easy. It instantly emulsify as soon as it comes in contact with water. This cleansing oil is suitable for oily skin users, not for my dry skin. The main functions are deep cleansing into pores, remove sebum and blackheads. This deep cleansing oil offers deep cleansing that is thorough and it is ideal for those who wear heavy makeup. It melts down makeup, sebum and blackheads and cleanses the skin from impurities effectively and effortlessly. It contains Natural Virgin Coconut Oil, which has tiny molecules for easy penetration into the skin, giving it the cleansing power to wash away waterproof and heavy makeup without leaving any residues while Ganghwa Mugwort Extract a natural antibacterial ingredient that is moisturising and refreshing yet cleans deep into pores and removes toxins from within the pores. The Ganghwa Mugwort Extract is also rich with minerals and vitamins such as calcium, iron, Vitamin A and Vitamin C that enhances the skin’s resistance towards damage caused by free radicals. It is also formulated with 6 types of certified organic herb extracts that function to replenish moisture in the skin and soothe the skin. The 6 herb extracts include Centella, Lavender, Chamomile, Marshmallow, Lemon Verbena and Aloe.